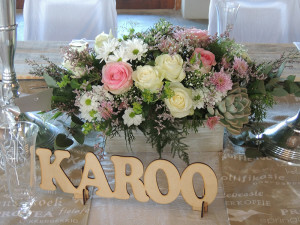 Poplars Estate was the venue for Marizane & Wickus’ wedding on 6 June 2015. This wedding was definitely inspired by “Africa” – from the table names, the table runners and chargers, the use of pallets for the place names – not to mention the rock-rose table gifts. Congrats Marizane and Wickus. All the very best for your married life together and the journey you are about to embark on together. It was a pleasure meeting you both. Professional photographs courtesy of Renske de Klerk Photography. Please refer to the photo gallery for the finished look. 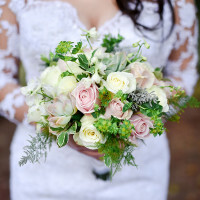 Wedding Flowers and Decor © 2019. All Rights Reserved.